Is there an accepted stat that analysts use to measure how consistent a basketball player is? Take points per game (or points per 48 min): two players with the same average scoring rates could have very different game distributions. Of course standard deviation comes right to mind (after you standardize it to account for high vs low scorers), and it makes sense when I try it. Even if you use standard deviation, would any adjustments be needed? I'm not sure for example if low scorers would need to be handled differently, or if that all comes out in the wash once you standardize the data. And do you weight right skewed data differently, so it hurts your consistency rating less when you score more (vs less) than your average? What scale is most intuitive to use for the "consistency" measure? If you use standardized SD, for example, would it be %, where 100% is the player who always scores 12 every night? (what a machine!) Is there a scaling that would make comparisons between two realistic players' consistencies more meaningful than 25% vs 35%? So I wonder if consistency is a "thing of interest" in sports analytics, and if so how pro analysts handle questions such as those. I initially didn't post an answer because Per 36 isn't widely accepted as a useful stat. In short, "Per 36 Minutes" normalizes production. Chris "Birdman" Andersen typically had respectable Per 36 numbers (averages a double-double), but never averaged 36 minutes per game (ostensibly due to lack of stamina or being best used sparingly). Beware that this stat also shows things like "12 fouls Per 36" because the player administered two fouls in six minutes of play. 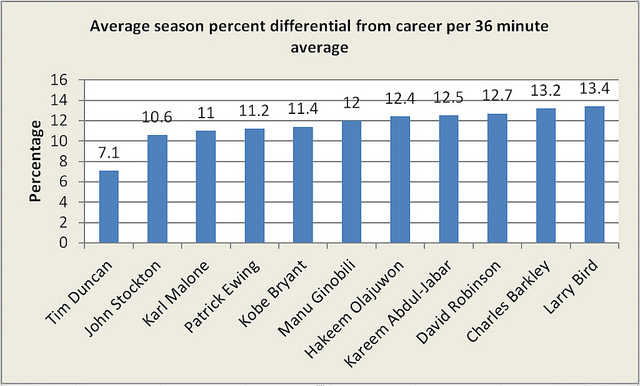 As you can see, Tim Duncan is far and away the most consistent player when considering his first ~15 seasons. Compared to Andersen's 17.7 MPG, I am much more comfortable with Duncan's 34 MPG as a more accurate measure of Per 36 consistency. Is there a “player of the year” award for international basketball? Why isn't there an advantage rule for fouls in basketball (similar to soccer)?